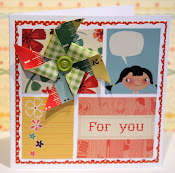 This LO was made to this weeks challenge over at Lotus paperie. "use your mismatched alpha-stickers". I had so much fun making this LO. This fun and happy picture has been around for a while, and I really wanted to scrap it, and this challenge was perfect. 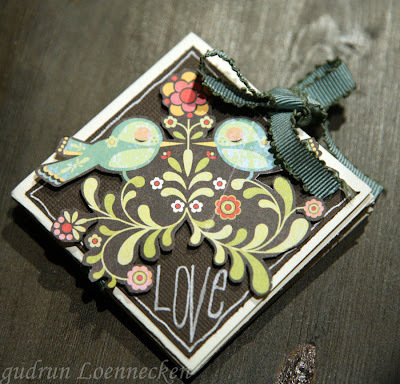 Make sure you visit Lotus Paperie for more inspiration, and to participate in this challenge. There are some changes over at 3ndypapir. I have really tried to make a post this week about the very sad fact, that Lene, my very best friend and "partner in crime" is leaving 3ndypapir. We have worked so hard to make this dream of ours come true, to create our own brand of patterned paper, to own this tiny little company. 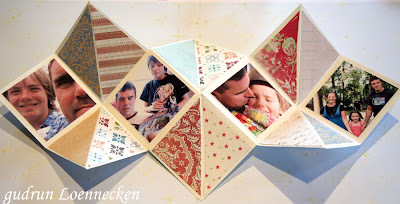 I'm so thankful for all the beautiful creations all you wonderful papercrafters have made using our paper. 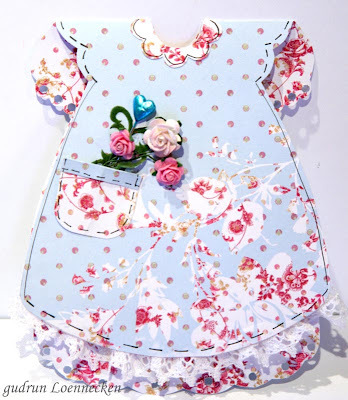 All your wonderful encouraging comments...the success we have had with our lines and collections are all fabolous. This really mean alot to both Lene and me. 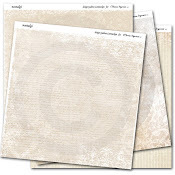 I have decided I will continue, I'll make new lines of paper for 3ndypapir. - I want to run this company even if Lene will not be there. She will allways be my friend, and I know we will meet and have fun and create...and maybe there will be new projects in the future. but I'm here by my computer, ready for a new Inspiration monday, I wear my warm woolen pullover, and keep the fire going, so everything is good. 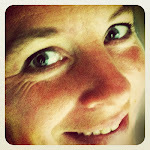 And today my face and my heart is smiling a extra large smile, while I welcome the readers of Scrapbooking.com magazine too. 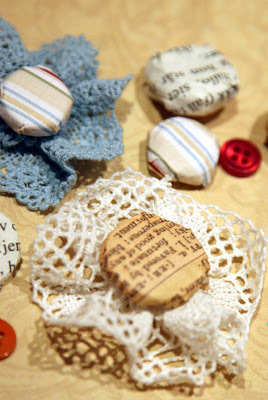 I'm SO happy and honored my blog has been featured in this weeks Scrapbooking.com newsletter. 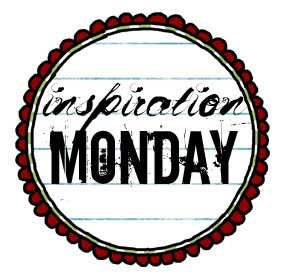 So on to this weeks inspiration Monday. I've been really inspired by grid-pattern lately. 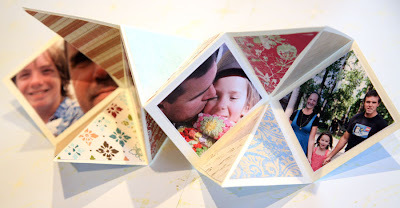 This is a great way to add lots of photos and keep the LO fresh and clean. 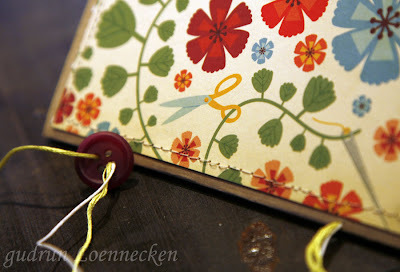 I also wanted to add alot of journaling on this LO, and decided to make a hidden journaling. 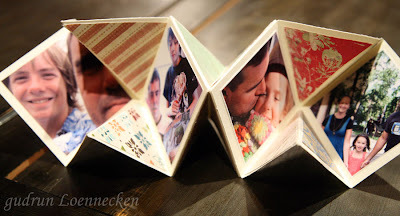 The grid allows me to put all the photos on the outside of a folded "card", and add the journaling on the inside. This LO is a hybrid project. 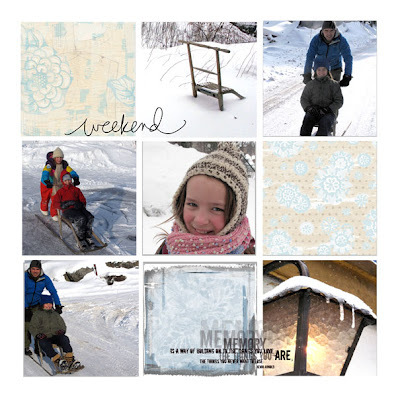 I used this grid-pattern and added photos, digital elements and digital patterned paper before I printed it out on photo paper. You can download the grid if you like and use it as your guide when you make your grid-inspired LO. 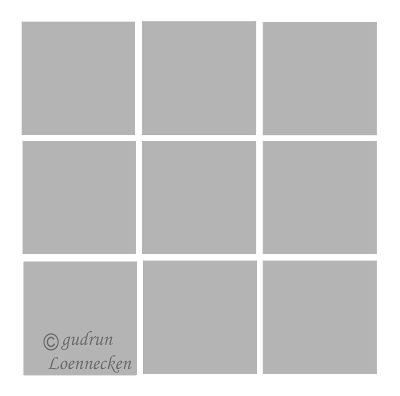 I resize my photos, use the squares as a guideline and add my photos on thop of the grey squares. 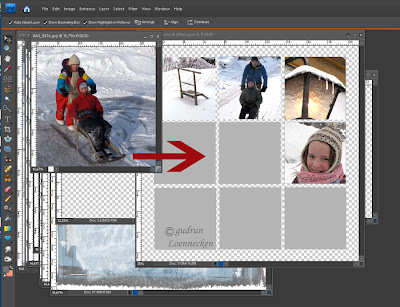 In Photoshop, resize the photos you want to use, and drag and drop them on to the template. 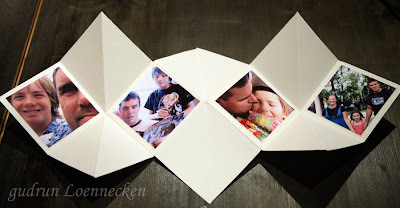 Put the photos in the order you like to have them, and add digital patterned paper to the squares without any photos. 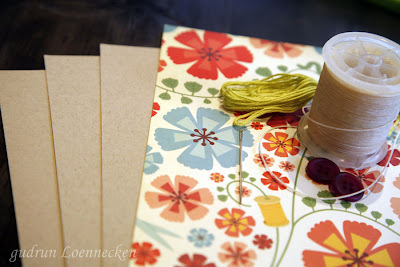 I've used patterned paper by Kerry Lynn and Veronica Ponce. 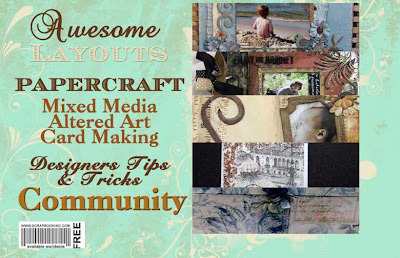 I added some free digital word art by Ali Edvards and Veronica Ponce ( free 2Peas kit ) on top of my grid. 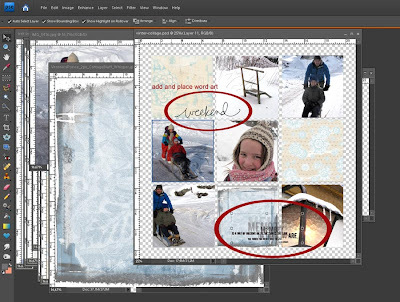 This is one of the things I love the most about hybrid scrapbooking - my freedom to add text, words and digital elements on top of my photos without any hassle and mess. Now, my grid-LO is ready. I printed it out on photo paper and cut it in shape. 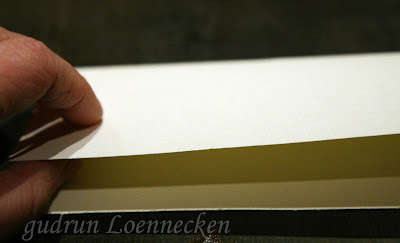 Now on to the paper - "traditional" - part of this LO. 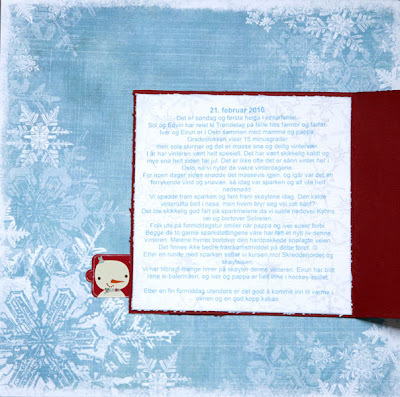 -red cardstock (or the color you prefer for your matting / hidden journaling-card. -stickers embellishments. I have used stickers from "Cosmo Cricket "Jolly by Golly"
-stickers alpha. 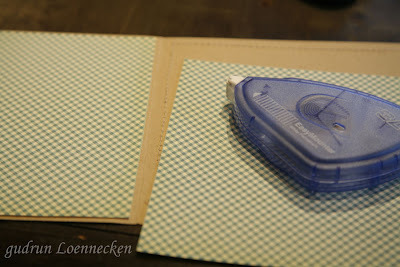 Thickers by American crafts "rainboots"
Start with writing your journaling ( I use word) and print it out to fit on the inside / back of your photos. I printed mine out to be the same square size as the picture-block. 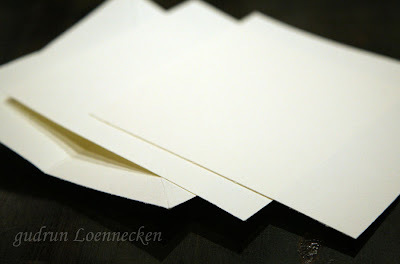 Cut the cardstock in size. 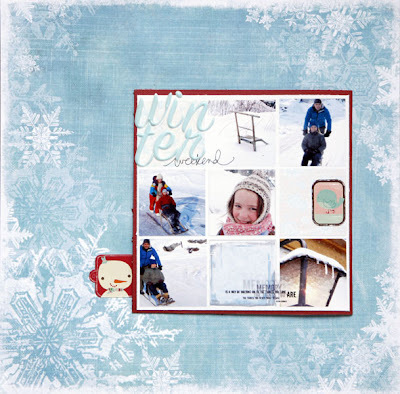 To add some more intrest to the journaling I stamped some snowflakes around the edges and on the top of the journaling with a light blue color using my "let it snow" stamp-set by my Stamp BOX. Now I cut my red cardstock in size. 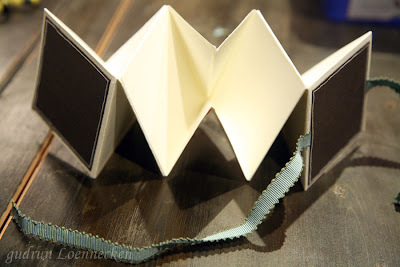 I wanted the cardstock to be folded as a card to hide my journaling-box. 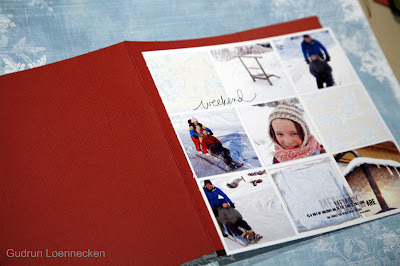 Now I added the pictures to the outside of the card and the journaling-block to the inside of the red, folded card. 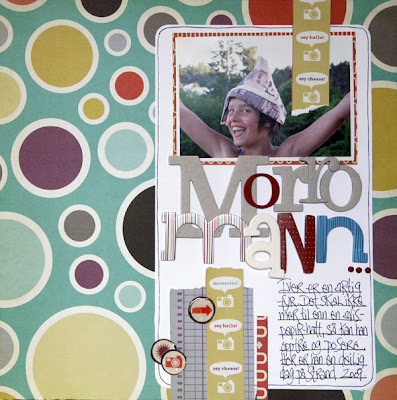 I placed the block on to the background paper and used my doublesided tape to adhere the photo-journaling-"card" to the background. 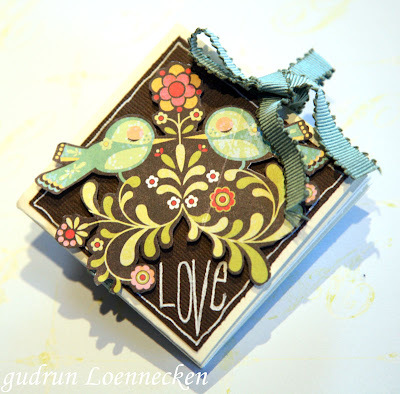 I added some little stickers-embellishments on top of my picture-block and on the patterned paper. I added the title on top of my pictures too. 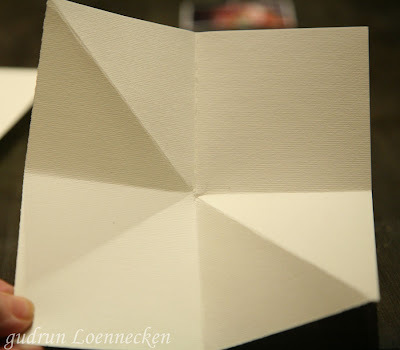 Here is the journaling-block inside the folded card. 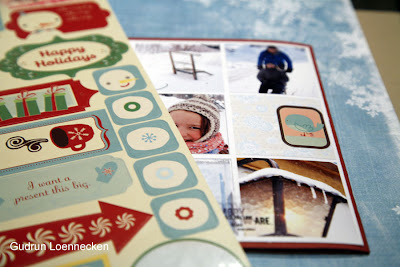 Hope you feel inspired to add some more journaling - some hidden journaling and lots of photos to your LO. 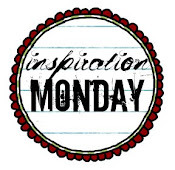 And please link me up if you make a LO inspired by this inspiration monday. I would LOVE to see what you all create. and THANKS a billion for popping by! The weather in Oslo is still ice cold winter weather. Lots of snow and -15 degrees celcius. "mom, how long is it winter-time?" kids: "what!!??!! are you kidding??" me: "nope! 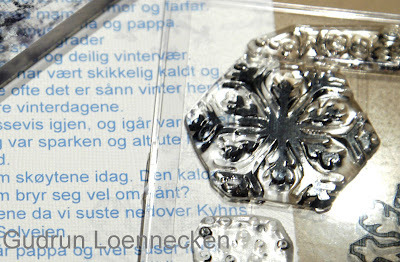 we live in Norway......"
I also had this little button-and flower-tutorial up at LOTUS paperie the other day. Run on over for more inspiration. 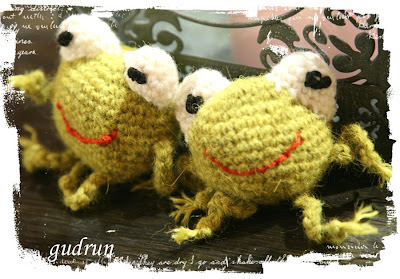 I used alpacca wool "mirasol" from Du Store Alpakka for my green frog, and just some baby-wool for the pink frog. start off with ch 2. Rnd 22: *Sc2tog, sc in next sc; rep from * around - 12 sc. Stuff piece. Rnd 23: (Sc2tog) around - 6 sc. Join yarn to Body with sl st and ch 10. Work (sl st, ch 5, sl st, ch 3, sl st) in 4th ch from hook. Eyes to Body. Weave in ends. You can make the frog any size you like, just stop increasing, or increase more rounds to make your frog the size you like. hele frosken er heklet med fastmasker. sc2tog= ta sammen to masker. 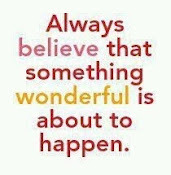 Hope you had a wonderful sunday, valentines day, mothers day, Chinese new year, Fastelaven and so on yesterday. I had a wonderful (!) sunday with my loved family. 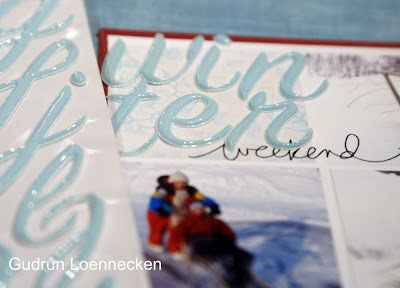 Lots of yummy food, gifts, flowers, chocolate, coffe, creating and a lovely winter weather here in Oslo. 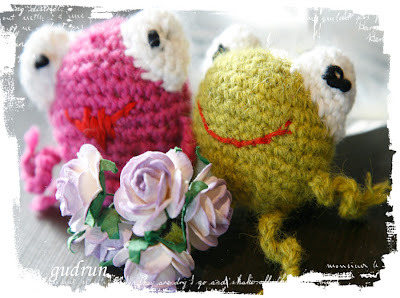 Eirun and I created this little amigurumi frog couple. Today I'll share my love for a simple, fast and fun minialbum. 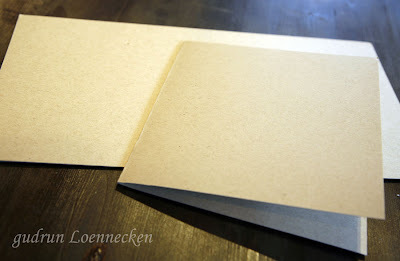 Cut the 3 sheets of neutral cardstock in 12 x 6 inch size and fold all the pages in half. 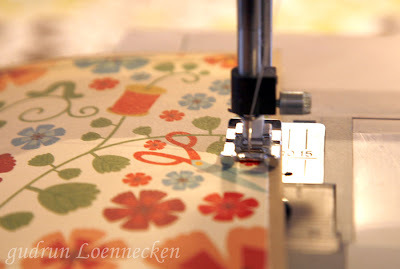 sew along the edges of the patterned paper with your sewing machine. 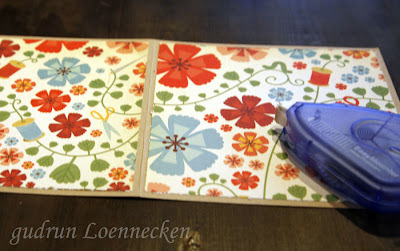 add two 6x6 inch pieces of paper to the inside of the cover. 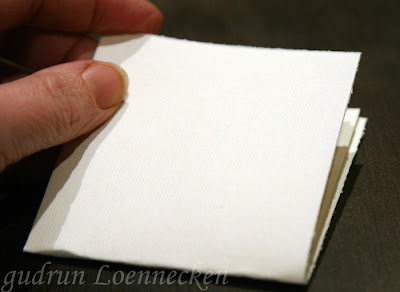 Gather all the neutral pages inside the cover. 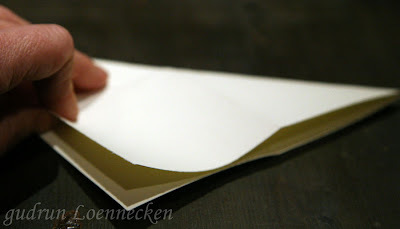 make 2 holes trough all the pages in the folded edge. I used my needle to make holes. 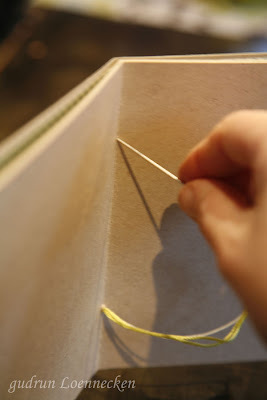 Using DOUBLE tread, sew trough the holes, starting from the outside of the cover, leave a long tail of the thread on the outside, sew trough the holes, and leave the rest of the thread on the outside. You'll now add the buttons to the thread on the outside of the cover. 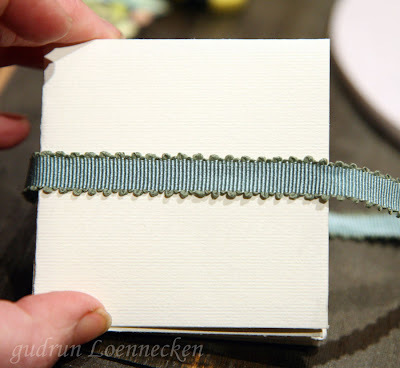 put one thread trough each of the holes in the button and tie a knot and a sweet little bow on top. I added some beads to the waxed linen tread. 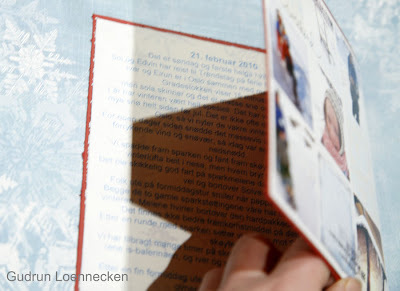 The book is ready to use! 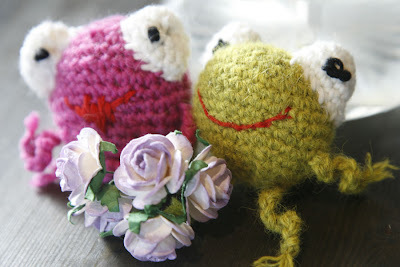 Finally I'm ready for some valentine inspiration this week. 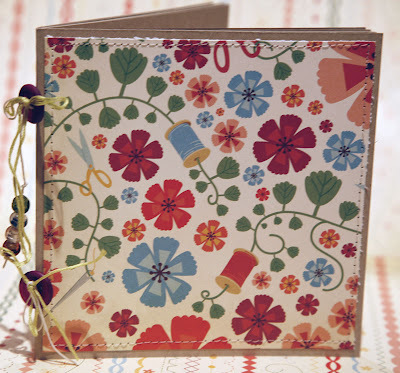 The flu still bugs me, but I've been out today bought some sweets for my love, and I made this little mini album earlier this week. 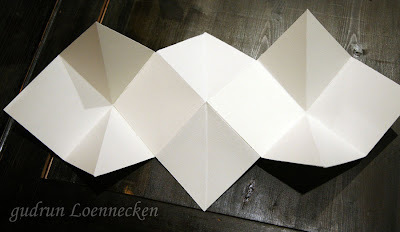 - fold your pieces of cardstock in half and in half and in triangle. Open, and you'll get these scores: Lenghtwise, horizontal and from left to right corner. 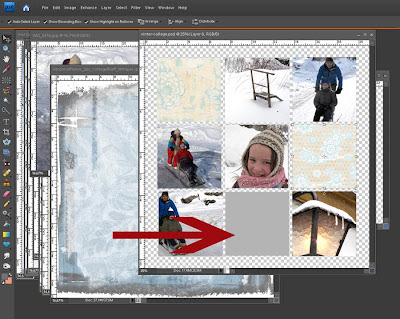 Crop your 4 photos in size to fit in the squares. Mine are 7 x 7 cm. Add the photos to the open squares. 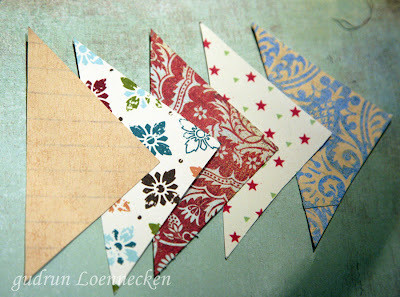 Cut pieces of patterned paper to fit in all the other open spaces of the album. 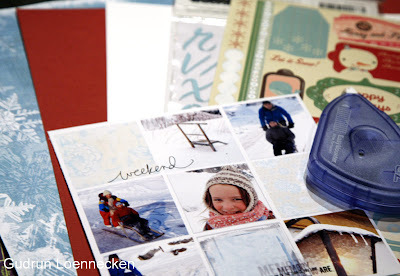 Add the pieces of patterned paper to your album. 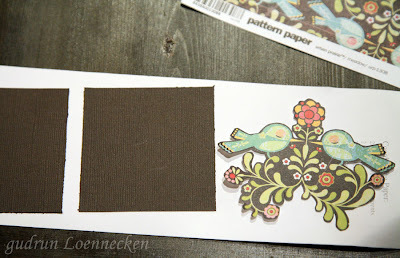 Cut two pieces of dark brown cardstock 7 x 7 cm and cut out the pattern you want to use as an embellishmenmt on the front of your album. 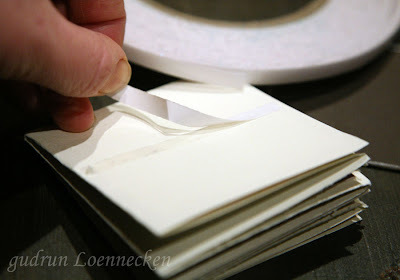 add a piece of doublesided tape to the front cover of your album. 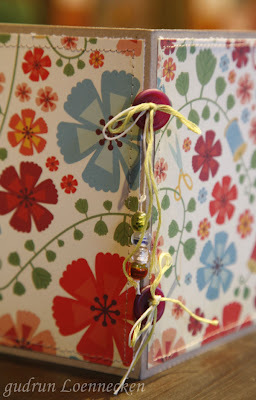 Add the ribbon that will bind the album together. 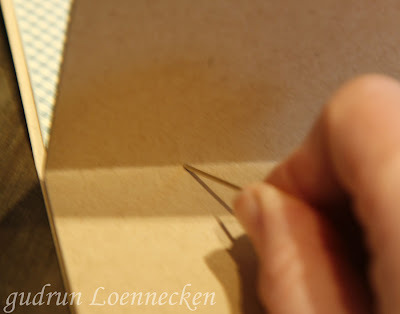 Add the brown square that will be the front cover on top of the ribbon, and add the back cover on the back side of your album. The album is basically finished now. 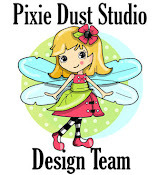 Add text or embellishments of your desire. 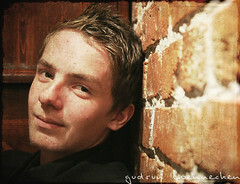 And please, leave me a link if you play along and make this minialbum too. I would LOVE to see your project! !